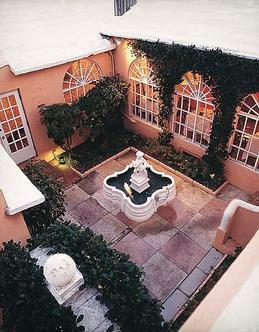 Fourways Inn is ideally situated right in the heart of Bermuda, on the border of Paget and Warwick parishes. We are 10 minutes from Hamilton, the Island's main town and shopping district. Both an excellent bus and ferry service run to Fourways. Golf courses and beaches are closely, t-off times and water sports can be arranged for you by our staff. Our units are comprised of deluxe Bermuda Cottages consisting of separate suites and king-sized doubles picturesquely arranged around a fresh water pool. Each temperature controlled unit is equipped with a kitchenette, large bathroom, mini-bar, cable TV, hairdryer, bathrobes, radio alarm clock, telephone and safety deposit box. Suites also have a queen-sized sleep sofa in the living room. NOTE: Please contact us with your flight arrival time.